In today’s hectic world where things can change in the blink of an eye, one cannot be dependent on anyone for anything. The concept of a self-sufficient energy economy at the national level can be implemented at the grass root level as well. It’s just a short step from saying our nation to our city, our street and finally our house. The fundamental idea here is that if each house is self-sufficient in and of itself, the nation as a whole will follow automatically. Thus, what each one of us, as an individual must strive to achieve is self-sufficiency. The first step forward in this venture is to make our houses ‘no-bill’ houses. This means that the entire energy required by the house is obtained from the house itself. The house must not use any electricity from the grid. Next, the houses must not be connected to the waste disposal systems of the city either. 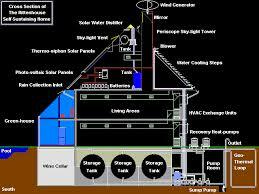 The energy required for the house must be generated from the waste discharged by the house. The water required must be collected by means of rain water harvesting and other such methods. There are tried and tested ways and means to conserve all the resources required in a house hold. The foremost of those is water. The best way to conserve water is by recycling. One of the activities that uses most water is flushing. This does not required clean water. Thus, in place of using normal water for flushing, one can use water that has already been used for bathing/ washing for flushing. Granted, this kind of an arrangement will require a secondary plumbing system and will inevitably increase the cost of construction of houses, but that is a small price indeed to pay if we think of it as our contribution to fortify our future. Advance techniques like reverse osmosis can produce drinkable water from polluted water irrespective of how polluted the water is, but such techniques are expensive. They can be adopted according to one’s financial capabilities. The next step is to reduce human waste. Usually when one’s home is not connected to the main sewer lines, use of septic tanks is common. In these tanks, the solid and semi-solid wastes settle down that the bottom of the tank and are digested by anaerobic bacteria. The remaining waste can be used as an excellent fertilizer. The water that is collected over the waste is taken to another chamber where further settlement takes place. This is then moved to a leach field and the water that finally flows out is fairly clear and percolates through the soil to return to the ground water. Thus, when done in a large scale, this has the potential to replenish ground water levels. Moreover, methods such as composting, in which anaerobic digestion of organic waste by bacteria generates heat. This can then be used for supplement household energy requirements. Electricity is one of the most important indices of measure in today’s world. It is fast becoming expensive as well. Thus any ways that help in minimizing the amount that we spend on electricity will be welcome. 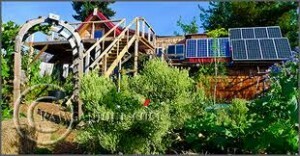 Unfortunately, most of the alternate sources that we can use in a self-sufficient home are on the expensive side. Yet, looking at long term cost savings, some methods can be implemented to save electricity. The most obvious of these if of course, solar power. Solar power can be used in two ways. One is the use of solar energy in photovoltaic cells to generate electricity. The other is to use solar energy directly as a means of heating. In this way, the energy that is used for heating water can be saved. Water heaters consume a huge amount of power. Thus solar water heaters can be a viable investment. One point that can be noted in the design of solar cells is that they will seem like an additional cost if they are installed on roofs. But if we use solar roofs, i.e. if the entire roof is made up of solar power harnessing material, the cost can be optimized as buildings require roofs anyway. In areas where solar energy alone is not enough, it can be supplemented by using miniature windmills for power generation. But this may not be viable in areas where the average wind speed is not up to the required level. The methods discussed so far are aimed at sustaining an independent home. However, if the house is connected to the power grid, the methods for generating electricity mentioned above can be put to use in a different manner. During periods when we do not require power from the grid, i.e. when the power generated by the house is in excess of its requirements, power can be fed back to the grid, and one can be charged on the basis of the difference between the power fed back and power consumed. Finally, shifting from the house to the community level, most of the measures mentioned above can be adopted to a community as well. One additional method of power generation is by using ‘Green Pass’ turnstiles. These kind of turnstiles generate power when someone passes through them. Thus, if placed in areas like railway stations or temples, a reasonable amount of energy can be generated. In a nutshell, on whatever level change occurs, it has to start with you. Be the change.